Rockland County, New York is a thriving, diverse community. Outstanding schools, colleges & universities. Access to excellent health care & human services. A mix of businesses including health, retail, manufacturing, pharmaceutical, construction & research. A wide range of recreational and cultural activities. An extensive park system that has grown because of Rockland's Open Space Preservation Program. These factors make Rockland a desirable community to live, work, visit, own a business & raise a family. 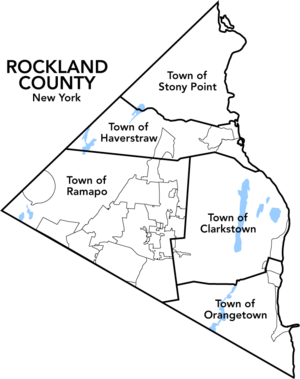 Rockland County is made up of 5 Towns which consist of Villages and Hamlets. Clarkstown Hamlets consist of New City, Nanuet, Bardonia, Congers, West Nyack and Valley Cottage.